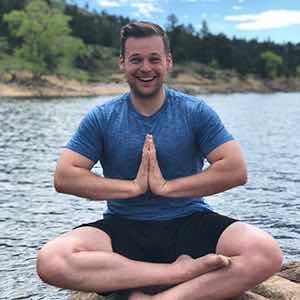 Outside of being a curator for the Music to Practice Yoga Playlist, I work for a tech startup called Asana in San Francisco. On the side, I teach yoga part time at CorePower and run an online men's group. I've always wanted to go to Bali. I've been having a big travel bug lately and have had a calling to go fulfill it. I've been around music for my entire life as my dad always had a few guitars lying around the house. The earliest I can remember is him trying to teach me Sweet Home Alabama on the guitar when I was around 8 years old or so. I think I remember it so well is because that was the first time I successfully played anything on an instrument - and it helped launch my love for guitar and started my journey to many other areas of music. I made a lot of mixtapes growing up - but not really for anyone in particular, just because I loved putting together a playlist to see how I could link from one song to another. I'm a yoga teacher and have been making playlists for almost every class over my 2.5 year tenure. As I kept searching for music, I came across a playlist that had 1000s of followers which sparked the idea of sharing my playlists out. I'm all about nature and earthy rhythms. When you listen to my tracks, you'll see a natural progression from the beginning of the list, to the middle, to the end in terms of volume and energy. As it's designed to start from integration through savasana. But each piece has a connection to Mother Earth that drives the practitioner all the way home. Not to mention the music I choose needs to bring out authentic emotion. Tell me where in a yoga sequence this song will go. There are quite a few different themes during a single class - you've got your slower and light integration song, to your beat driven melodic tunes to where we flow. And certainly let your passion come through when writing about the piece. If I can't feel anything from your words, chances are I won't listen to the track. Caitlin Moss from Music to Forget Your Feelings - you're up!